Today in The Lounge, Nick chats Veronika Miller, the founder and CEO of Modenus and Official Media Partner with KBIS. Veronika will discuss her collaboration with KBIS and the line-up of events at KBIS 2018. Then stayed tuned for Nick’s conversation with Kajsa Krause and Tracey Sawyer of Krause Sawyer at the Porcelanosa showroom in NYC. The duo will discuss their partnership, their love of travel, and how they created their niche in the hospitality sector. Veronika Miller is the founder and editor inchief of Modenus, a comprehensive digital resource for design professionals and design enthusiasts. Modenus began in 2009 and added a social media component known as the Blog Tour in 2011. The goal of the Blog Tour is to bring both people and brands together. The following year KBIS approached Modenus to help them connect with the design community, to build a bond and to reach design professionals who were not necessarily engaged in the kitchen and bath industry. After this initial contact Modenus became an official media partner with KBIS. This January will mark their 6th Blog Tour together. The Blog Tour has been hugely successful for Modenus. They have a community of about 250 bloggers who they reach out to for recommendations on what/who is new and interesting. These nominees are then narrowed down and the final blog tour participants are selected. In addition to the Blog Tour, each year Modernus compiles a Top 100 Influencers list, which again, is entirely community driven. Reaching out to the design community provides an endless resource for continued networking and education. 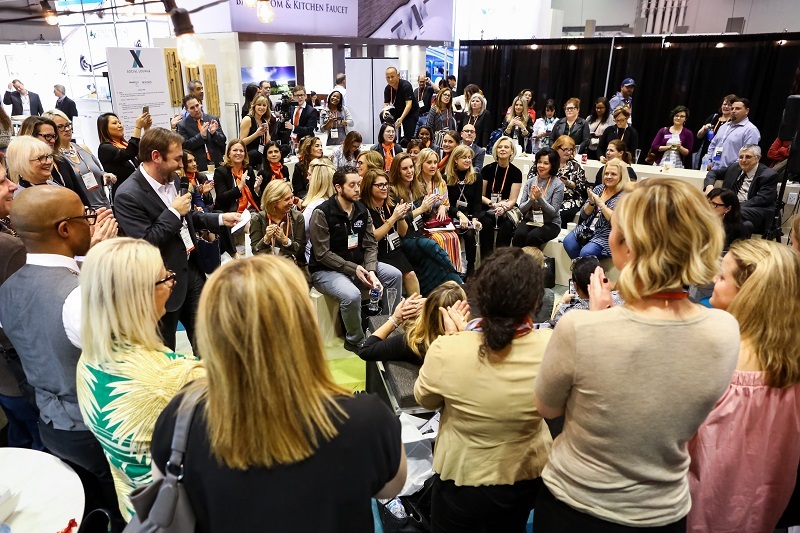 KBIS 2018 will kick off with a networking event entitled Champagne and Cupcakes on Tuesday, January 9th from 9:30-10:30 am. Hosted by Modenus, this invitation-only event will feature media influencers, designers, and media to celebrate the beginning of KBIS. Healthy cupcakes and a little bit of bubbly will be on the menu to honor their sponsor, Signature Kitchen, a new luxury division of LG, whose mission is focused on living well and living in a healthy way. There will also be giveaways, speakers and an introduction by Brian Pagel, VP of Kitchen and Bath division at Emerald Expositions. There will be many design events, speakers, and educational opportunities at KBIS. Jaime Derringer from Design Milk will be teaming up with Modenus at the lounge cafe, Design milk x Modenus Talk lounge. Mirroring the format at Wanted Design in NY, the lounge cafe will provide a relaxed atmosphere with refreshments, phone charging stations and an opportunity for everyone in the room to talk and share their thoughts. The event will also be streamed on Facebook live. Claire Jefford will also be hosting an event with several design influences that will cover the topics of Technology and How It Relates To Design and Social Media Do’s and Don’ts. This Old House will cover topics on skilled labor global design and working remotely and The Good Home Redux will cover the impact of design on wellness and sustainability. For those new to KBIS, the large scale of the show can be overwhelming. Bring comfortable shoes and be prepared to walk. The dress code is business casual, most attendees wear jeans and polo shirts, with a few designers choosing to dress up. It is about one mile between halls. Veronika recommends starting at West Hall, which is the main area that houses the bigger brands and follows a more traditional format. Plan on spending an entire day there. On a separate day, focus on the North and South Halls, where the stage, discovery district, which houses the smaller up and coming brands, the Modenus lounge and an outdoor area with catering can be found. Plan about 15-20min to get to where you are going. On Wednesday, be on the lookout for Design Bites. Similar to speed dating, Design Bites give exhibitors an opportunity to discuss their product and why you should visit their both. KBIS is also co-located with the International Builders Show. If there is something you are looking for at the show but can’t find it be sure to check out the Builders Show. On the final day of the show is the not to be missed event The Bash celebrating Design and Construction week at KBIS. For More Information on KBIS visit www.kbis.com. Although Kajsa and Tracey grew up in different parts of the world, they both share a love of travel, design, and a good white wine. When Kajsa was a 6-year-old growing up in Gothenburg, Sweden, one of her favorite pastimes was making an elaborate home for her Barbie dolls. She found architecture as a natural fit as she enjoys math, science, and working with her hands. Kajsa began turning her passion into a career after she received her Master’s degree in Architecture while living in Gothenburg. Tracey also enjoyed designing spaces for Barbie, while creating elaborate snow-covered surroundings in her native Manitoba, Canada. 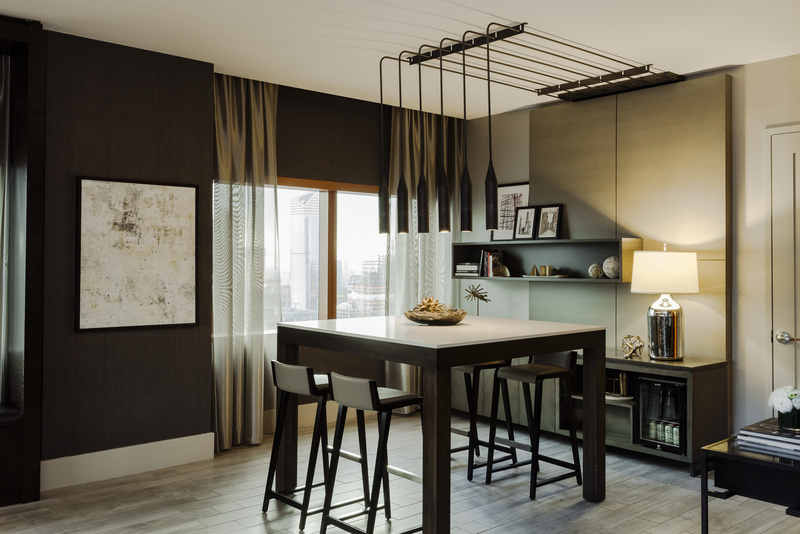 Tracey found herself drawn to the problem-solving aspects of design and ultimately received her Bachelor in Interior Design from the University of Manitoba. Upon graduation Kajsa and Tracey found themselves doing a lot of travel. Tracey traveled to Paris, Europe, Turkey, Ukraine, through the Mediterranean, where she spent 3 months in Greece working on boats, and finally to the UK for a year to work in interior furnishing before she returned back to Canada. Upon returning to Canada she landed her first job in facilities management which appealed to her logistics point of view. Growing up in Europe, Kajsa spent a lot of time traveling throughout her childhood. Her first big trip to the United States as an au pair which gave her the opportunity to hone her English skills. She returned back to Europe to work on her Master’s degree and intern at a sustainable architecture firm in Norway. Kajsa returned to the the US once again but this time as a dancer in New York City. With a few connections, she began working at architecture firms around the city. Tracey and Kajsa joke that they really don’t know when they actually met. Their partnership came about organically. They were mutual friends in the industry and often met up with each other at industry events. They can agree that it was at a dinner party where the notion of their partnership came about. Their firm, Krause Sawyer, is located in NY and has a staff of 10. They focus on hospitality, restaurants, resorts, hotels and high-end residential. Their first project together was a W Hotel in Mexico, they have since gone on to do conceptual work on haciendas, resorts in Los Cabos, and have done work for Host, their largest American client. The existing brands that they work with have introduced them to new clients and word of mouth has also been key in growing their business. As partners, they both like to work on the same things. This has been a great check and balance system for them and has worked well for the past 6 yrs that they have been in business. They begin projects together, run teams, design and conduct business development and administrative functions. Their staff consists of designers and architects at different levels of experience who are responsible for running all aspects of the projects. Their typical process begins with bidding and proposal delivery. Writing clear proposal is imperative. The team takes into consideration how many different spaces and areas there are in the project, the amount of available space and the length of time for the project. Each project is broken into clear standard phases: schematic design, design development and construction documents, with clear end dates and room for potential changes. Each phase is documented very clearly and receives a sign off upon completion. They work on a fixed fee by area budget that is occasionally broken up by use types, such as public spaces or food and beverage areas, in case the client wants to pull a section out to save on costs. Tracey and Kajsa prefer branding and boutique projects as it appeals to their problem-solving nature. Branding projects provide a unique opportunity for storytelling with a set level of luxury and refinement. As the hospitality industry continues to evolve, smaller individual brands are starting to have more of a clearly defined vision. While larger bigger brands are offering more diverse amenity programs. Other newer trends in hospitality consist of flexible food and beverage offerings, smaller room sizes, fluid social spaces, and an emphasis on wellness and local cultural identity. Sustainability continues to play a role as designers seek to select durable materials that have a longer lifespan, while the building itself is being designed to be more energy efficient as determined by stricter energy codes. Clients are becoming more involved in the process with the big brands reviewing their existing system for efficiencies and establishing their own set of sustainable guidelines. To learn more about Kajsa and Tracey visit www.krausesawyer.com. Want to go to Spain? The Chaise Lounge and Porcelanosa will be selecting a listener to attend the Porcelanosa Factory tour in Southern Spain. To enter, visit the Porcelanosa showroom, take a selfie and post on Instagram using the hashtag #letsgotospain. Tag @thechaiselounge and @porcelanosa_grupo for your chance to win! Start competing early to score the most points. The person with the most likes, shares and posts will be selected for the Porcelanosa factory tour in Southern Spain. Find the official rules here or click on the #letsgotospain on the sidebar!